Last week I had the chance to fly to Kansas in the back of a 206 and then to fly 2 out of 3 (well, 2 out of 4, which I’ll explain later) legs of the trip back, in a 182. It was great flying with 3 other pilots from Squadron 188 and/or the newly formed Tri-Valley Squadron – Lt Col DeFord, Maj Fridell, and 1st Lt Choate. This was my first time flying quite so far from (or rather, “to” in my case) home. Straight-line distance between KIDP (Independence Municipal Airport, Kansas) and KLVK (Livermore Airport, California) is 1237.2 nm – times 2 out and back. That’s a lot of flying in two days. 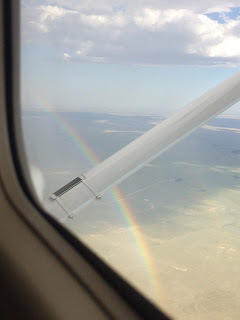 A little too far for a Cessna to do in one sortie, so we broke up the trip into 4 legs out, spent the night in Independence, and planned for 3 and actually flew 4 on the way back. What’s at KIDP? The Cessna factory! We flew there to pick up an old 182Q with a new engine. Another first: I’d never flown an aircraft with 21.1 starting Hobbs time before and kept thinking it must be missing some digits. 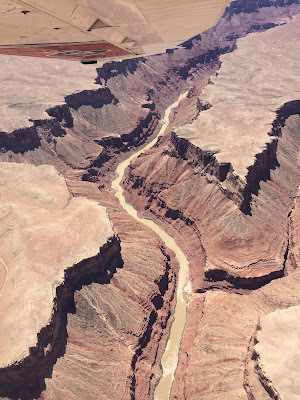 Canyons not too far from where we flew past the Colorado River where it flowed into the Grand Canyon (south and at that point somewhat west of us). With neither Maj Fridell nor myself being (yet) 206 qualified, Lt Col DeFord and Lt Choate took turns flying the 206 to KIDP on the way out, each taking 2 sorties: KLVK to KVGT (North Las Vegas, Nevada) to KFMN (Four Corners, New Mexico) to KLBL (Liberal, Kansas) to KIDP. It was a long (and hot) day: We met at KLVK early, for takeoff around 7 AM, and didn't arrive at our hotel in Kansas until around 11 PM local time. The brief stop at KVGT was fun for me, since that’s where I had done my private checkride! It being Las Vegas in the summertime, however, it was hot, and we were all happy to push on quickly. Changing terrain as we head further east on the leg from KVGT to KFMN. 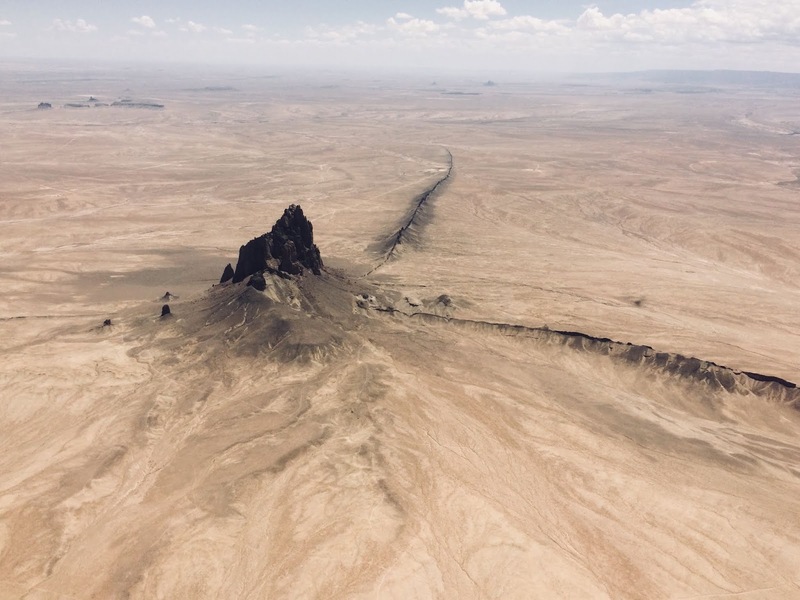 Interesting rock formation en route to Four Corners. One of the most interesting things for me on the flight heading east was seeing the terrain change across the US going from west to east – crossing the Central Valley in California, crossing the Sierras, then Death Valley, Las Vegas, the desert and plateaus just north of the Grand Canyon, then more mountainous terrain, then a gradual slow descent into the plains of the Midwest – all viewed at much lower altitudes than if we’d just hopped on a commercial flight. To be sure, we flew high enough to need oxygen on two of our legs – both to fly over mountains and to stay a little cooler – but it was still a lot lower than airliners! On the second morning, we checked out our “new” airplane and found it had very little by way of extra equipment – but it did pass our thorough preflight inspection, after we put in a few additional quarts of oil. 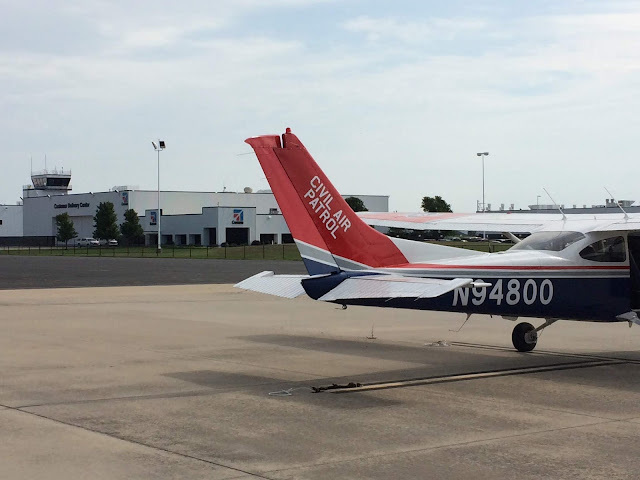 It took a while to visit the offices of the Cessna factory, get fuel at the local FBO, and convince ourselves that yes, the airplane was airworthy. We launched – by late morning, making for another long day on the way back. Very different terrain nearing Kansas! On the flights headed west, we split up, with Lt Col DeFord and Lt Choate flying again in the 206 (and being able to take on more fuel without having to worry about those pesky two additional passengers in the back), and Maj Fridell and I flying the 182. Since the 206 had weather info in the cockpit, and the 182 did not, we decided to fly together so that Maj Fridell and I could get our own, personal in-flight weather advisories from the 206. 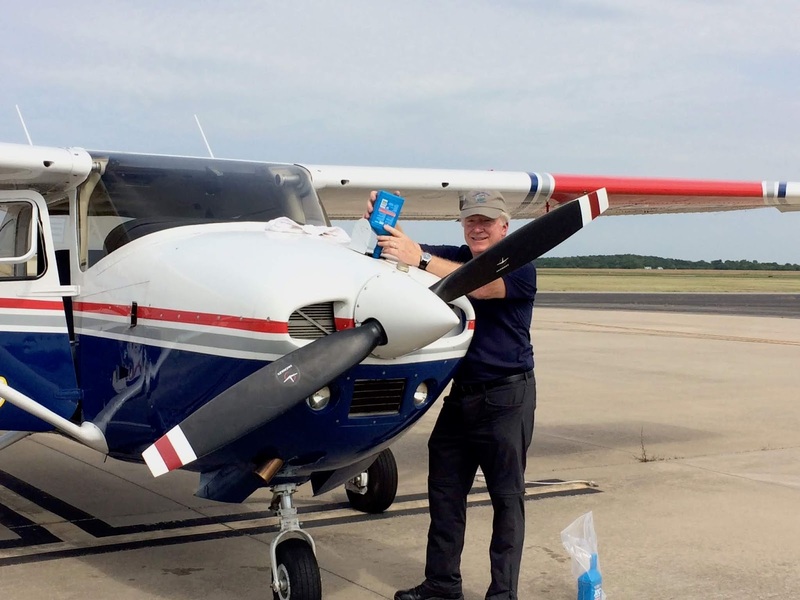 This, combined with input from the very helpful ATC personnel we talked to throughout the day, came in very handy, particularly as we deviated around several thunderstorms moving through our planned flight path. Maj Fridell flew the first leg, from KIDP to KTCC (Tucumcari, New Mexico). With the late start, I was ready for lunch by the time we arrived at KTCC… but the airport is well outside of town, so I settled for a lemonade and whatever snacks I could find in my flight bag. We decided it would be fun (and on our way!) to land at KGCN (Grand Canyon Airport) so that’s what we did – even though flightseeing around the canyon was not on the agenda. Still even the surrounding area is beautiful. I will admit to a rather steep final approach to the airport, because there’s a busy heliport immediately next to the runway, and I couldn’t help but be uncomfortable with having several helicopters right between me on short final and my touchdown point … I guess that’s what slips are for, so that’s what we did. It was stabilized, just a little (lot) steeper than normal! Our "new" plane at the Cessna factory in Kansas. At KGCN we were greeted by some friendly folks from the FBO, who not only refueled our aircraft but drove us into town (and picked us up again), so that we could finally have a late lunch at an excellent Mexican restaurant. 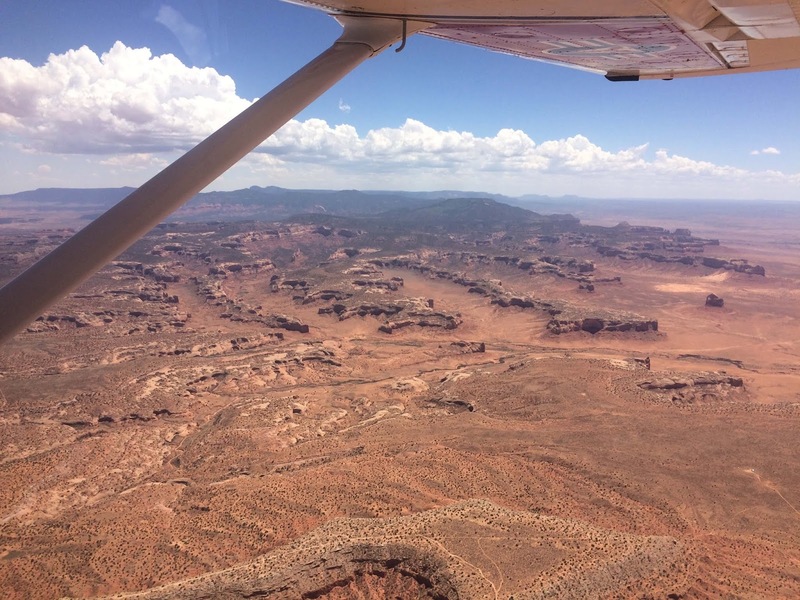 From there, we debated our options for flying home, either on the same day or with one more overnight somewhere between the Grand Canyon and KLVK. After some discussion, we decided a safe course of action would be for us to change things around a bit, with Maj Fridell hopping into the 206 and Lt Col DeFord flying with me in the 182. Maj Fridell, adding oil before we left KIDP. Since it was going to be a very long day, I had no desire to fly home by myself, with crossing the mountains, moderate altitude, landing at night, still fairly unfamiliar avionics, etc. Having another accomplished pilot in the right seat next to me was a big help. Not having oxygen and having a new engine in our plane, we diverted somewhat to the south, to avoid crossing the higher peaks of the Sierras, especially after dark. 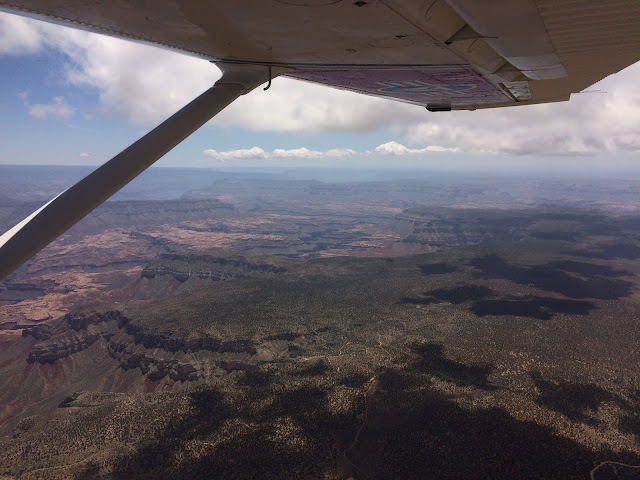 This way, we were able to fly low enough to not need oxygen but still high enough to have lots of safety margin between us and the ridges we crossed – and could see the valley ahead just as it was getting really dark. Based on our planning, and with full tanks, we intended to fly all the way home. En route, however, our engine was running hot and, taking steps to keep it cool, we used up more fuel than planned. Flying further north toward home, we eyeballed our fuel gauges and recalculated and considered our late night options. “It’s probably enough…” “I think we can make it…” At that point, we looked at each other and decided that even having to ask that question was really enough to provide the answer – let’s land and refuel. Would we have been OK? In hindsight, yes – if nothing else happened to cause us to deviate. Even though the last leg after refueling ended up being a very short hop to our final destination, KLVK, we were both very happy with our decision to stop. Better to be safe and get home and to bed a little later than to not make it home at all. Plus, we met someone while refueling and might have recruited a future new member! Being an early morning person and having just flown almost 8 hours, I was far too exhausted to consider flying the last leg – many thanks to Lt Col DeFord for doing so and getting us safely back on the ground at KLVK. Besides having a great time with 3 other pilots on this transport mission, I had fun learning about longer cross-country flying trips; differences in weather patterns when flying west-east – and west again (rather than the north-south cross-country trips I’ve done more of to date); getting weather help from ATC and from our friends in the 206; and considering the very real impact of fatigue after two long days of flying and of the desire to get home and forcing oneself to nonetheless balance that against safety considerations. These are considerations that anyone flying long days will run into – and they become very real. Now, go out and fly our “new” plane, which is currently still based at KLVK! We can never know how long we’ll have it, so I encourage all of our Group 2 pilots to fly it sooner rather than later.